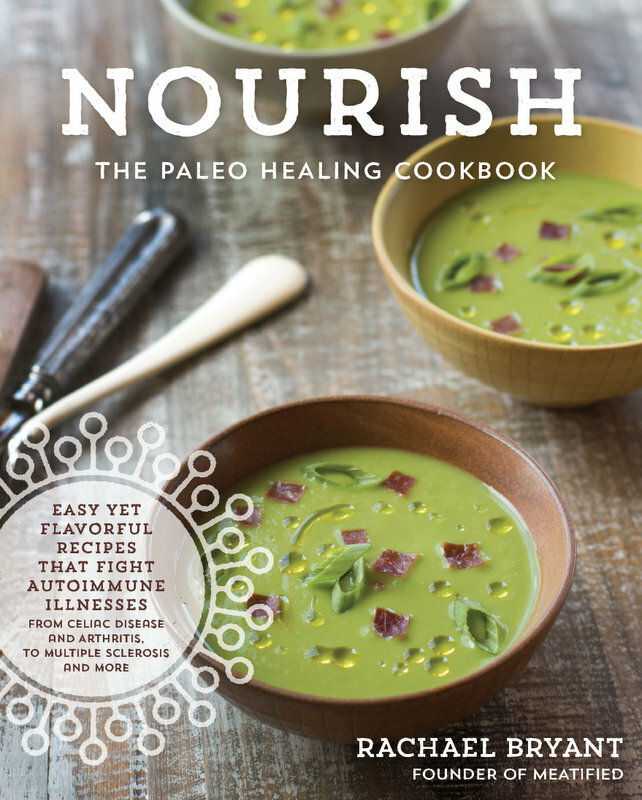 Just a few years ago, there were no cookbooks for the Paleo Autoimmune Protocol (AIP). We had to adapt our own recipes and “wing it.” For a lot of us, that meant our food was pretty boring. Not any more! We now have enough books that people are starting to branch out into specialties. Nourish is a cookbook for people who love food, love flavor, and want to ban boredom from their kitchen. What do I mean? Instead of a plain burger recipe, you'll find Duck Fat Burgers with Mango and Avocado Spread. Instead of simple chicken breasts, try Chicken Street Tacos with Blueberry Salsa. Instead of sausage patties, how about Sausage Gravy “Benedict” in Portobello Mushroom Caps? Is your mouth watering yet? You can find the full recipe list here. Do you follow the food blog, Meatified? There you'll find gorgeous photography, creative recipes, a great sense of humor, and a mysterious author who keeps her name and photo off the blog. (Personally, I picture her with a cape, like a foodie superhero.) With this publication, she's revealed her name (Rachael Bryant), but she still likes to refer to herself and her husband as Mr. and Mrs. Meatified. Like many of you, Rachael has Hashimoto's, and she uses the autoimmune protocol to feel her best. Luckily, she's also a fantastic cook. Seriously, if I lived nearby, I'd be one of those annoying friends who just happens to drop by at dinnertime….every day. What Makes This Cookbook Unique? Original Flavor Combinations: As I say in the introduction above, these aren't recipes you'll find elsewhere. Your tastebuds are in for a treat! I especially like the last section of the cookbook called “Add A Little Extra.” It includes a wide variety of sauces, spreads and spice combinations. These are used throughout the cookbook, but can also be added to any recipe you want to give a flavor boost. What If I'm Not a Foodie – Are Any of These Recipes Quick? I'm the type of cook you might call a “fast foodie”. I love delicious food, and I actually enjoy cooking, but I don't love long and complicated recipes. So, I flipped through this book to see how many could be prepared in 30 minutes or less. I found 50 that meet that criteria. The seafood recipes, salads, and condiments can almost all be made quickly. While some recipes in the book do take more time, it's usually because they include one of her flavor-packed condiments, so it's a few recipes in one. A Gift for Seafood Lovers: Sarah Ballantyne recommends we eat a minimum of 3 servings of seafood per week, for the anti-inflammatory omega-3 fatty acids. This cookbook has more seafood recipes than any other AIP cookbook (23 recipes). Ethnic Menus: When we can't have nightshades, often our favorite Thai, Mexican and Indian foods are off the table. Rachael missed those so much, she created AIP-friendly versions. At the back of the cookbook, she's put together some party menus that highlight the variety of recipes in the cookbook: Indian Feast, Thai Takeout, BBQ and Fixin's, Get Your Greek On, Fajita Night, Go Team!, Picnic Lunch, and Swedish Meatball Plate. 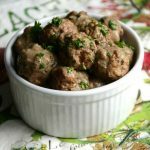 Mostly Coconut Free: Some people have a sensitivity to coconut, and since coconut is the darling of the paleo community, it can be hard to find recipes to eat. If this is you, today's your lucky day. Most of the recipes in this cookbook are either coconut-free as written (89 recipes) or can easily be adapted, and she provides notes on how to do that (another 15 recipes). What You Won't Find: Many desserts. There are only 6 in this cookbook, and that's brave, my friends! Bloggers will tell you that their cookie/cake/cobbler recipes get a million times more “hits” than their soups/salads/entrées. But if you saw my recent post on the AIP Food Pyramid, you see that desserts are at the top, which means they're meant to be a very small part of the diet. This cookbook is all about nutrient-density. In addition to a wide variety of seafood and meat entrées, she has an “eat the rainbow” section full of creative vegetable recipes (the foundation of the AIP Food Pyramid.) There's a reason it says “A Healing Cookbook” on the cover. It's the Prettiest Cookbook I've Ever Seen. Have you ever heard the phrase, “We eat with our eyes”? It means that we're affected by the beauty of food presentation, which is why cookbooks place a priority on food photography. The recipes have to taste great (of course) but if the photos are beautiful, people are more likely to try them. Rachael has a gift for photography; the photos look like art. The cookbook is also printed high-quality – in hardcover, with thicker pages, and brighter print than most cookbooks. 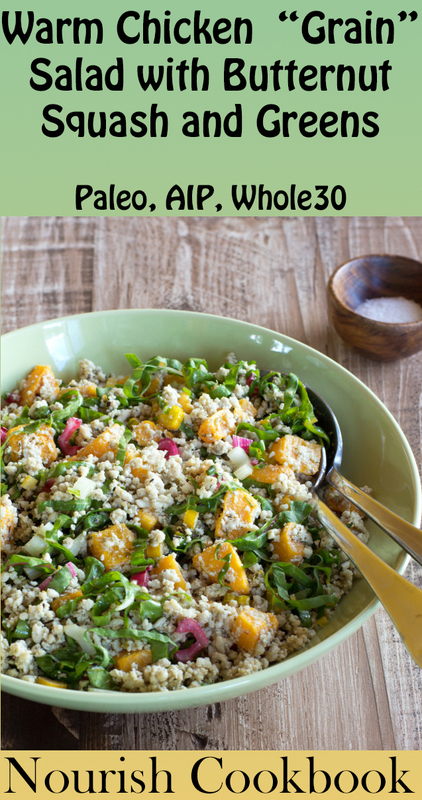 100% AIP: All 120+ recipes in this cookbook are written for the AIP as outlined by Sarah Ballantyne in The Paleo Approach. Sarah even wrote the forward for this cookbook, which is the ultimate stamp of approval. ROAST: Preheat the oven to 425°F. Cut the butternut squash into 1/2 inch cubes and toss with 2 teaspoons of the oil and 1/2 teaspoon of salt. Line a baking tray with parchment paper and spread the squash out in a single layer. Roast the squash until it is tender and beginning to brown and caramelize at the edges, about 15 – 20 minutes. Reserve the cooked squash for later. COOK: Add the remaining 1 tablespoon of oil to a skillet over low-medium heat. When the pan is hot, add the ground chicken, breaking it into a few large pieces with your hands before dropping it into the pan. Don’t break up the chicken in the pan any further or it will overcook and become very dry. Sprinkle the remaining 1/2 teaspoon of salt, garlic powder, sage and rosemary over the chicken and cover the pan with a lid. Cook the chicken, covered, until it is cooked through and there is no pink inside, about 5 – 6 minutes, turning the chicken over halfway through. Do not overcook the chicken – it should release juices into the pan and still be tender when cooked through. Use a slotted spoon to transfer the cooked chicken to a paper towel-lined plate. Add the diced onion to the pan and cook until softened, about 5 minutes, then remove the pan from the heat. ASSEMBLE: Crumble the cooked chicken into the bowl of a food processor. Pulse 3 – 5 times, until the chicken is broken up into little “grains”. Do not overprocess, or you will end up with a sticky paste! Finely slice the chard and spinach. 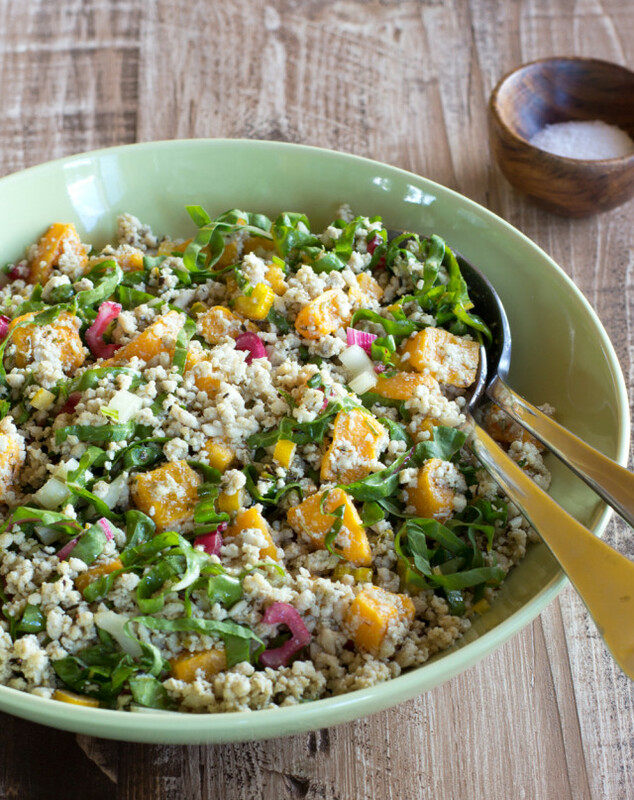 Toss together the “grains”, roasted squash, chard and spinach back in the pan with the onion and all the pan juices. Squeeze a little lemon juice over the salad, to taste, and toss together to combine. The salad can be eaten straightaway, but also refrigerates nicely so you could make it ahead of time and serve it as a cold “grain” salad, too. 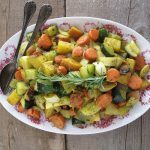 When it’s warmer, I like to swap the butternut squash for roasted asparagus, beets or summer squash and lighter greens, but the possibilities are almost endless! The winner was chosen with a random number generator on 4/24/2015. Congratulations to Alyssa Robertson! If you didn't win, don't despair. The book is reasonably priced and worth every penny. You can purchase a copy here. It's become a tradition on my blog to host giveaways of my favorite books. Entering to win is easy. Just comment on this post that you want to win. That's it! If you want to follow me on Pinterest, Facebook, iTunes, and/or Email, you'll get all of my tips for autoimmune healing. But it's not required at all. Since I love all my readers around the globe, this giveaway is open to anyone in the world. Good luck! The winner will be randomly chosen on April 24, 2015. And if you don't want to wait, you can buy a copy now. Disclaimer: I was given a review copy of the book as well as a copy to give away, with no obligation. I'm 100% honest in my opinions. If I didn't love this book, I wouldn't have written the review, nor hosted the giveaway. As proof, I'm putting my money where my mouth is; this book is heavy! Rachael donated the book, but I'm donating shipping, and I'll ship anywhere in the world that the winner lives.